Full disclosure: I own the Atlas Packs Adventure bag and have not received compensation for this review. The truth is there is no perfect backpack just like there is no perfect mouse trap. But I certainly think we can come close. We all carry different equipment, accessories, supplies, rain gear, hiking gear and the like. Some of us have small mirrorless systems and others, like myself, have large, medium format systems. We pack clothing based on weather, and gear based on complexity of the shoot. Some days you might only need a camera and one lens and other days you need to carry the full Monty of everything you own. Do you own multiple bags and depending on the situation, pick one? Or, do you have a bag that requires owning multiple and expensive interchangeable internal camera units (ICU) and are constantly having to exchange them? And while I’ve at times embodied all ends of these spectra, I’ve always been on a quest for the One Bag to Rule Them All. Since we are getting close to holiday time, I began my annual ritual of thinking about the things that I need (vs. want, which is a whole different discussion). My list always includes looking for a new backpack. While reading some of my favorite online photography forums, I noticed several posts about a relatively new company, Atlas Packs. I found some reviews and even some videos discussing their packs. Atlas Packs, located in Scottsdale, AZ, is run by a professional sports photojournalist, Allan Henry. He understands what it is like to travel with photography gear, being on the road, and in different conditions. Atlas Packs currently offers two bags, the Athlete (up to a 40 liter shell) and the Adventure (up to a 70 liter shell). It’s not so much what makes the two bags different as it is what they share. Atlas Packs reflect that humans come in different sizes. The bags are customized in terms of fit, offering regular and tall versions. They offer different size hip belts based on waist size. The hip belts are removable, too (a huge advantage in tight airline quarters)! And, since our torsos are all different sizes, the larger Adventure bag also offers an adjustable shoulder harness that can rise and fall so that the pack can sit properly on your back. Both bags also have incorporated a rear access panel that provides unobstructed access to your gear. The Adventure bag takes it another step by offering a side opening back panel. More on this later. But what makes the bags unique, is Atlas Packs’ patent pending adjustable camera core, what they call the Origami system. Instead of having to buy different size ICUs, one can increase or decrease the size of the existing camera storage area by up to one-third by flipping open and closed a center compartment. This provides added versatility to store additional camera gear or instead non-gear such as hiking or camping supplies, clothing, etc. No more ICUs! Very neat trick. 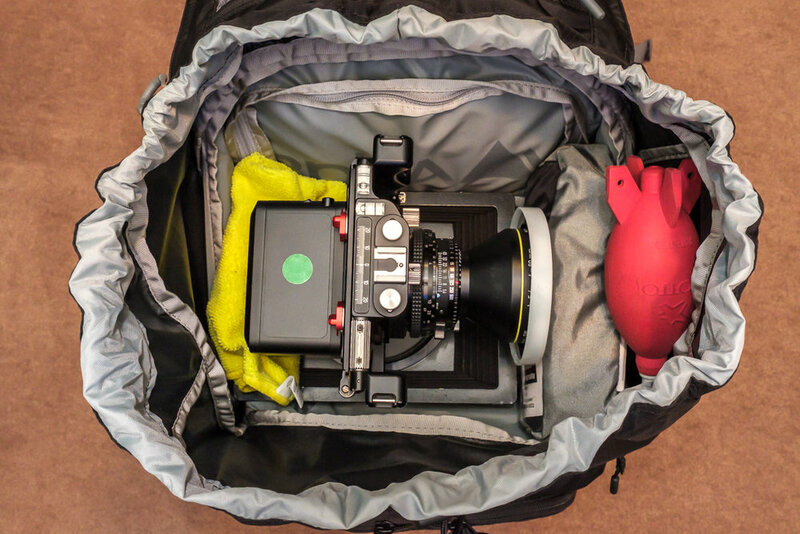 Here’s an example, from the Atlas Packs website, of the Origami camera core in action with the Adventure bag. The smaller Athlete bag is by no means a small backpack. I find it’s optimized for a mirrorless system or a full size 35mm system with just a few lenses. It also offers a lot of expandable storage space for hiking and the like. The larger Adventure bag is specifically designed to comfortably carry large professional camera gear long distances. Since the Adventure bag suits my equipment and style more closely, that is what I was interested in finding more about. Online pictures are nice and a few of the online videos are well produced but I really wanted to be able to see, touch and feel the bags myself. I had a chance to get my hands on both bags in October while I was at the annual Photo Plus Expo in New York City. I’d emailed Allan in advance, and he was happy to spend time with me at the Expo. Allan is a great guy and was able to address my questions and requirements. He’s really interested in his users’ experiences and seems genuinely committed in making the best backpacks available. In a nutshell, he gets it! Don’t take my word for it: If you call the company, he’s the one you’ll speak to. For my landscape and nature work I shoot primarily with a technical camera kit. Think 21st century version of a view camera. The large format lenses tend to be bigger than normal and are heavy. For me, every pound saved matters, but not at the expense of comfort and fit. I also have a large Phase One 80-100MP digital back along with the milled Cambo WRS body interface, which is used to join the lenses and digital back. The rest of my bag is filled with filters and holders, shades, tripod, guides, papers, snacks, and rain protection, and that’s exclusive of any camping equipment for multi-day excursions. The last few years I’d settled on another manufacturer’s backpack that served several (albeit not most) of my needs. Below is a shot of my former bag and as I generally packed it. This bag style uses an ICU. I’ve been using this bag along with the XL ICU for several years. I liked the rear opening concept, but it brought along some frustrations, too. The opening itself was not wide enough to reveal the full storage compartment. For me, care had to be taken not to damage a lens placed on the sides of the ICU. As a result, it was difficult and tedious to remove items in the camera insert that are located on either side of the opening as well as near the top of the opening. With the XL ICU inserted, minimal storage space was available at the top of the bag. The ICU also wasted space from side to side (with gaps between the ICU and the outside of the pack), so I ended up discarding the ICU and rigged up a padded divider for a 940 Nanuk (similar to Pelican) case to gain more space side to side (and a little more height). This gave me more room to pack things but made it more difficult to get things out on either side (it also added weight). Things like extra batteries, cable releases and my tilt/stack charts I had to lay on top of the lenses as there was no other place to conveniently put them for easy access. If I opened the bag in a windy location, I had to be careful that they would not blow away. The two zipped pockets on the top lid were also limited in terms of available space potential. Now, see below, the same gear in the Atlas Packs Adventure bag. (Yes, it was shot on white seamless!). Everything has a place and since the entire width of the bag is accessible via the side opening lid, I have no worry of damaging a tech lens as I am taking it out or putting it back. The items laid out along the top all fit in the upper pockets located in the top lid flap, with room to spare. My charts, cable releases and extra batteries all fit in the back flap/lid or pockets, as shown. The advantage of the rear opening, like my former bag, is that when you put the bag down in wet or muddy conditions, the part of the pack which is in contact with your back does not get wet. It is the front side of the pack which is on the ground. Love it! The front of the bag has room for my laptop when necessary, and a ton of other pockets for rain gear, hiking and camping stuff and things I haven’t even thought of yet (I can’t get enough of its pockets and storage!) I like that the waist belt has built-in side pockets for snacks and each have an attached pull out bag for holding a lens or a water bottle. The bag uniquely expands both vertically and horizontally. When you loosen the side compression straps, the bag’s depth grows from 9 to 13 inches. What I really like, is that the top of the bag opens up. With the top of the bag fully open and expanded, there is another 10-11 inches in depth to store things or carry equipment. So, if I do not want to take apart my camera and lens and only have a short walk to my next location, I can open the top, safely put the camera inside, pull the drawstring shut, snap down the top lid and move on to the next stop. This is incredibly convenient and will make a big difference especially in windy conditions. Strangely, while the smaller Athlete bag does have a dedicated water bladder pocket, the larger Adventure bag does not. However, there are so many other pockets on the front and the side of the bag (and connection points on the shoulder harness) you could easily attach a bladder, tube and mouthpiece, more or less, anywhere you want. My understanding from Allan is that future versions of the Adventure will incorporate a dedicated bladder pocket. The bag also comes with a tethered rain cover and is stored in its own dedicated pocket. Not an extra item to purchase, which is nice. Being tethered also means it won’t blow away. Show of hands, how many times has that happened to you?! Have I mentioned that this bag is comfortable? The waist belt reminds me of something more akin to a true hiking pack, not a photo backpack. When fully packed with my gear (tripod loaded and strapped in the front expanding pocket), the bag weighed 38 pounds and it distributed the weight perfectly. The adjustable height of the shoulder harness is exactly what a tall person needs (I’m 6’ 3”). After getting everything adjusted to my body and preferences, this might be the most comfortable photo bag I have ever had. I do have a few nits which I will discuss with Allan. For example, I think that the shoulder harnesses are a bit too close/narrow. Just a bit. As a result, they come over my shoulders closer to my neck and my clavicle, rather than the outer part of my shoulders. It just carries differently than what I am used to. Not bad, just different. Still, the most comfortable photo backpack I’ve had, period. Adding straps to top and/or bottom so that items can be attached. MOLLE straps on the sides to hang accessories. More loop tabs around the bag that allow for attaching hooks, carabiners, bungee cords, etc. Increase the Adventure backpack and camera core width by 1 to 1 ½ inches wider. I think that is the sweet spot, especially for the stuff I carry. When carrying the big Rodenstock and Schneider glass that I use, it gobbles up a lot of space from side to side. For example, I need about a 4-1/4 x 4-1/4 inches space for each lens. Assuming a ½ inch divider on each side and that means I can only put two lenses next to each other, leaving 1 ¾ inch left side to side. That could end up as dead space. I have plenty of small things to fill that space but another inch or so in width could make a huge difference. Going forward, the medium format, video, and drone industries are going to make up a larger percentage of camera buys, so larger bags will be necessary. Based on my measurements, the outside of Adventure bag is 12-12 1/4 inches wide. Airline carryon compliant is currently 14 inches wide. Obviously, as the backpack is filled with gear it expands (with my gear it is at 13 inches), so there’s still wiggle room for added space. I’ve discussed this with Allan and he appreciates always wanting to maximize space. He will be looking into ways of increasing the internal storage width without affecting the external bag width and without compromising protection of gear. Another customer service plus, they listen! After this deep-dive, I can’t recommend Atlas Packs enough. I am sure either the Athlete or Adventure Bag will suit your needs more than any photo backpack you’ve had. To me, the Adventure bag might well be the best, overall camera backpack out there for the ambitious, outdoor photographer. Yes, there is no one perfect camera backpack….but boy, this comes close. Let me know if you have any questions, thoughts or comments.